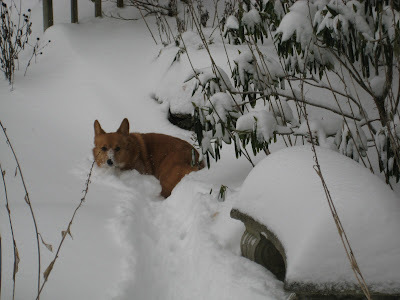 Meanderings and Muses: Snow! Doggies! Monkeys! Oh My! We've had a bit of snow here in Boone. But I prefer watching it from a window while sitting in this little corner with this book and this cup of coffee. Wearing these monkeys on my feet. It snowed here in Illinois, too--nine inches in Champaign. 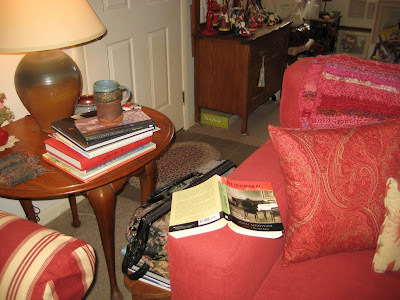 I am with you, love to watch it snow from inside my warm, cozy, home office, coffee near at hand, and good book or entertaining blog to read. My slippers aren't as entertaining as yours, however! One of the best perks of being newly retired is that I do not have to clear my car and go to work tomorrow. Joy! Harley is adorable! I totally am on board, though, with enjoying the snow from a window in a warm house, reading, having tea, cuddling with Corgis and cats...! Looking forward to your blog, now that I've found you! Perfect, slippers, a hot drink, and a good book. 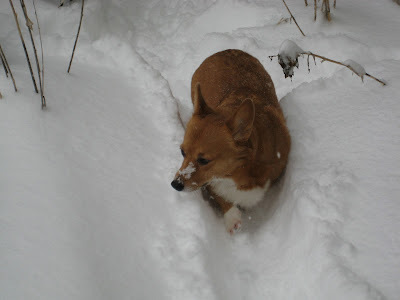 Let the Corgi deal with the snow. How cute. 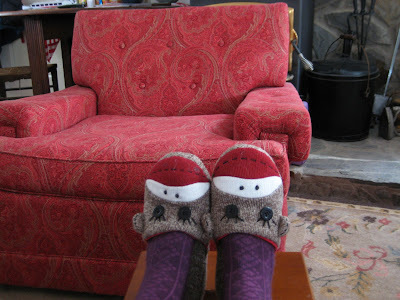 Even the monkey slippers. LOL Seeing the dog in the snow reminded me of when I moved from Texas to Nebraska in February. Took two small dogs who had never seen snow before on a day it snowed 15 inches. I put one dog outside to do her business and she just looked at me as if to say, "You expect me to do what out here in whatever this is?" I spent a number of years shoveling paths and clearing a spot that became a doggie bathroom. Harley and snow are a great combination! And how cozy all that red looks in your house! Cool dog and slippers for a great person. Thanks, Kaye. I bet Harley got lost out there today! Just got back from a walk with Zippy. BRRRR....Your feet look very cozy in those slippers. Still snowing here. We're up to about 10 inches (I think). Hard to tell, with the wind blowing so hard, we're getting drifts. Phyllis - I am ready to join you in retirement!! Aren't those slippers a hoot?! My sister-in-law gave them to me for Christmas. We're big sock monkey fans. Darla - Hi! Welcome fellow Corgi lover!! I'm glad you found us too. Patty - thanks for sending your Mom's fudge recipe - it sounds divine! Maryann, hi! The things we do for our pets, huh?! But, that's what it's all about, I guess. They give us so much in return. Vicki - thank you! I'm loving my red furniture. I'm glad I went ahead with it and didn't let my trepidation scare me off. Hey There le0pard! Thank you, my friend. you have GOT TO TELL ME where you found the slippers. Please ma'am. Andi - aren't they adorable?! My sister-in-law gave them to me, but I'm pretty sure I remember her saying she got them at Target. We don't have a Target in Boone (which KILLS me! ), but I'll look on-line.